A Hotel in Athens - The Hieno! The interior was designed with large, light-filled spaces that benefit from the shiny marble and walnut, two materials that are prevalent throughout. 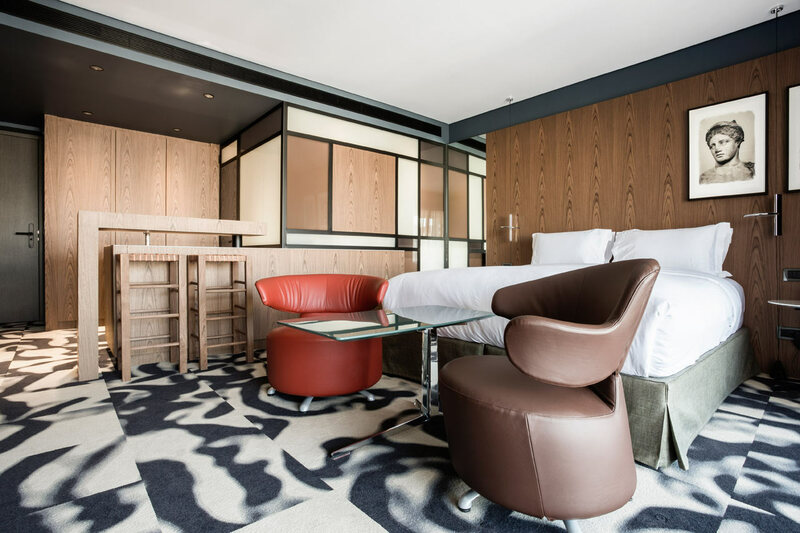 Throughout the hotel, furniture by legendary designers, like Le Corbusier, Ettore Sottsass, and Michael Graves, was used. Just off the street, the hotel’s restaurant invites guests and anyone passing by to come into the classic space full of wood, spicy tones, and a buffed marble floor. The space’s mid-century feels comes courtesy of the Luisa Chair, by Franco Albini, a 1950 design for Cassina, along with accessories from Ettore Sottsass, Michael Graves, and Mario Botta.